What are the shortcut keys for the FullContact for Mac app? 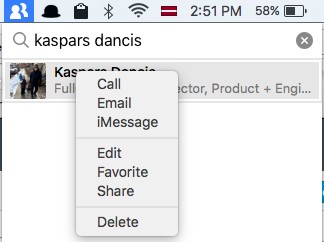 What is the menu bar version of the FullContact for Mac app and how can I use it? The menu bar version (of FullContact for Mac) exists only when you have the FullContact for Mac app open. To set FullContact to show only the menu bar app, go to FullContact -> Preferences [ ⌘+, ] -> select Hide Dock Icon. Menu bar version allows you to search, contact (email, iMessage, call), add new contacts, view contact details, edit contacts (will open a new window), add a contact to favorites, merge or delete contacts. How can I search for a contact in the menu bar version? To search a contact, start typing in the search bar; search doesn't work in URL fields yet. FullContact will automatically show details for the first contact in the list. How can I add a new contact in the menu bar version? 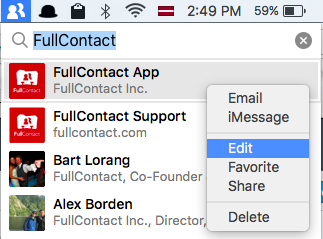 To add a new contact, you will need to type in information that's not matching any existing contact, or by clicking ⌘+ N (this will open the dock version of FullContact for Mac). How can I edit a contact in the menu bar version? To edit a contact, click on the pencil icon in contact view or with right-click on a contact. Right-click also allows you to email, iMessage, call a contact, add it to favorites, share, or delete it. How can I select multiple contacts in the menu bar version? You can also multi-select contacts to merge them, contact them (email, iMessage, call), favorite, share, or delete them.